Download Your Free Guide - Are Low Quality Scores Costing You Money? 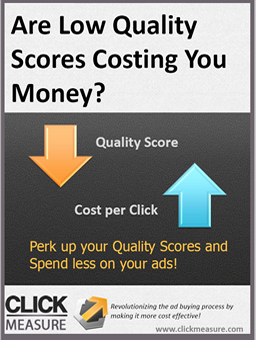 Perk up your Quality Scores and Spend less on your ads! There has been much discussion on the topic of Quality Scores in advertising just as in Ranking for SEO is can be a rather complicated topic with many different approaches. First, we will answer the question of why you should be interested in a “QS” and explain exactly how it affects you as an ad buyer. In this guide you will find detailed instructions on how to improve your Google AdWords Quality Scores and save money on your paid search advertising by lowering your average cost per click.